I am a simple man. I am by no means smarter than the average man. I am average...yet genius. I don't know what it is, and that's wierd, but it looks FUN! How about a hint? Caliber? Looks .22lr to maybe a .45 auto at the other end of the possibilities, I'm going with .22. It's an Australian Owen Submachine gun, designed by Lieutenant Owen in 1939. Yes Wustenfuchs it is .22 as the time that he presented it as a prototype. 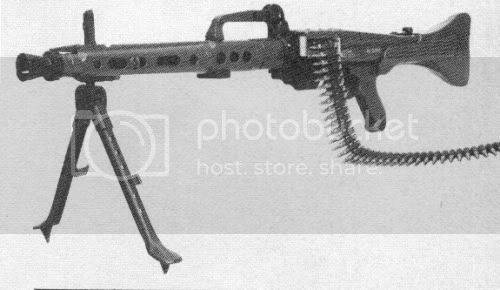 As It'd be too blindingly obvious to put up an Mg42, and I notice the barrel vents and carry handle are wrong, it's Either the MG-1 or the Ameli Version of the MG-3 used by Spain. "He fell out of a Gestapo car, over a bridge, and onto a railway line. Then was run over by the Berlin Express. Wow. Your pretty good, but how bout this? AK-74, due to the muzzle break, and the little indentation above the Magazine. purely a guess Rocket Launcher, M20 "Super Bazooka"
As to that, it's not a bazooka, ithe colour system for the rounds reminds me of the RPG colours. It also looks like it has a dual warhead, for anti ERA work. So I'm saying RPG of some flavour, most likely post 1990. RPG-29, and I do belive it went in service before 1990. Is it not completely different weapon...? I belive you are correct. The Ameli just looks like the MG3, the mechanism is however closer to the HK21 MG family. All times are GMT-5. This page was generated at 01:29.